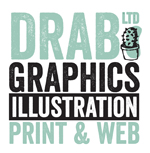 Drab Ltd. is a locally based design team with years of experience. We design for branding, brochures, books, websites, interpretation, education, exhibitions and installations. Our in-house illustration can complement your needs. We manage print, photography and copywriting. In short we provide a complete service and pride ourselves on building and maintaining close and trusting relationships with our clients. …because we’re small you’ve got our full attention.